David Leigh at MI6, the James Bond website, not the British intelligence agency, offers an interview with John Pearson, the author of James Bond: The Authorized Biography. 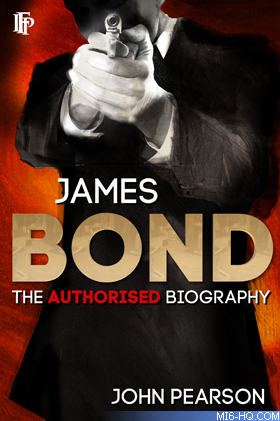 How did the James Bond biography come about? Prior to writing it I know you’d already written Ian Fleming’s biography, did you come up with the idea or were you approached to write it? What it came from really once I’d got the idea of doing it, actually I think it was someone most unlikely, it was Lord Longford of all people, he was in charge of the publishers Sedgwick and Jackson, it was he I think who had the idea, because after the authorised life of Ian he said “why don’t you do the life of Bond?” and it made a sort of sense because, and this is the hub of the book, my theory is that Bond was Ian’s alta ego, he was the self who he invented almost as a fantasy self to supply the various things that were lacking in his own life. ... and after the war he told his friend Robert Harling, who was a chap I used to know on the Sunday Times, after he’d been out on the Normandy beaches with 30 Assault Unit which he’d created, that after the war he’d write the spy story to end all spy stories, and of course he did. And it was rather incredible that he did, lots of people say this sort of thing but they never do it. But what I did find once I started writing it, I did get rather carried away by it and I felt I knew Bond very well because I’d known Ian and it was rather an uncanny feeling. I devised this idea that switching the books round that James Bond was the real character and that the books that Ian wrote of him were a cover for him and that he was asked to write them to convince SMERSH and the Russians that actually Bond didn’t exist at all. It seemed quite a useful gimmick and one could produce this book on the strength of it. Was South Philly Man Murdered In Mob Hit?